Tag line: "Once... they made history. Now... they are history"
Forget the title; there’s nothing bogus about this 1991 sequel featuring everyone’s favorite rock star hopefuls, Bill S. Preston, Esq (Alex Winter) & Ted “Theodore” Logan (Keanu Reeves). In fact, I’d say this movie is every bit as excellent as its predecessor. As established in the first film, 1989’s Bill & Ted’s Excellent Adventure, the future is a much better place thanks to the bumbling pals and their questionable musical skills; by the year 2691, war, hunger, and pollution have been eliminated, and every school offers a class on the finer points of rock and roll. But there are those who don’t appreciate this seemingly utopian society. Enter Chuck De Nomolos (Joss Ackland), a former teacher bent on controlling the world. Hoping to alter the course of history, De Nomolos sends a pair of evil robots, designed to look exactly like Bill & Ted, to modern-day San Dimas with instructions to kill their real-life counterparts before the upcoming Battle of the Bands. Sure enough, the murderous doppelgangers complete their mission by dragging Bill & Ted to the top of a cliff and tossing them over the side. Having killed Bill & Ted, the robots then set their sights on seducing the former medieval Princesses, Elizabeth (Annette Azcuy) and Joanna (Sarah Trigger), who, in the five years since they traveled to the 20th century, have joined the duo’s band (Wyld Stallyns), and, more recently, agreed to marry the now-deceased best friends. Eager to save the Princesses and destroy the evil robots, the ghostly remains of Bill & Ted evade the Grim Reaper (William Sadler) and make their way back to San Dimas in the hopes of finding someone who can help them. Alas, things go from bad to worse for our heroes when, mistaken for malevolent spirits during a séance, they’re inadvertently banished to hell. But with the help of the Grim Reaper, as well as their old pal from the future, Rufus (George Carlin), Bill & Ted may just cheat death after all. 4. Compete against The Grim Reaper (unlike Ingmar Bergman’s The Seventh Seal, where he played chess for the soul of a knight returning from the Crusades, this Reaper is subjected to such modern-day games as Battleship, Clue, and Twister). And that’s not the half of it. Before Bill & Ted’s Bogus Journey comes to an end, they’ll have traveled to places no mortal has ever seen before, brought to life by way of some interesting special effects This, coupled with an inspired performance by William Sadler as The Grim Reaper, keeps the film moving along at a brisk, entertaining pace. Yet, despite how crazy things get, Bill & Ted approach it all with the same unbridled enthusiasm they showed during their Excellent Adventure. As played by Winter and Reeves, these two characters always maintain a positive outlook, so much so that not even a trip to hell can ruin their day (and as depictions of the underworld go, this one’s fairly creepy). 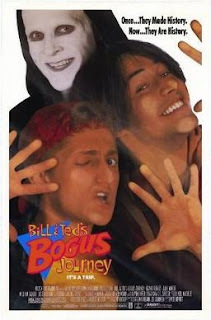 Its unpredictable story makes Bill & Ted’s Bogus Journey a fascinating film to watch, but it’s the infectious attitude of its lead characters that makes it so much fun. It's been a while since I last visited your page. Sorry about that. Man! This is one of my favorite movies of all time. As far as re-watchability goes, this is pretty high on my list. It also has to be one of the best comedies—if not of all time at least from the '90s. The cast is just spot-on. This is almost at the level of Ghostbusters as far as casting goes and the chemistry between the leads.